With this, they created themselves anew. 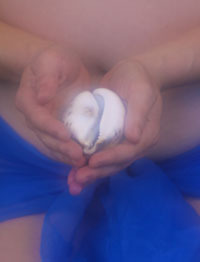 Aphrodite's Journey is an intermediate workshop in women's sexuality. We will celebrate the divine inner-marriage of Heart and Yoni as we experience our rebirth through the womb of Aphrodite, Mother Goddess of Love and Beauty. Attendance requires either previous work with me in the form of a weekend intensive, Hellerwork, or Tantric Dance, or a personal interview process. We will be exploring healing on many levels, including dance, meditation, ceremony and touch. Due to the sacredness of this initiation, I prefer to keep the details a mystery to be experienced in the moment. If you need more information in this regard, I am open and willing to have a conversation with you and to answer any questions you may have. "Aphrodite's Journey touched me in a way that was profound and unexpected. I found confidence and appreciation for myself as a woman and remembered the unity of human experience. I highly recommend this journey for women who are choosing to embrace and heal the feminine. It was one of the best planned and paced workshops I have ever attended." - Naomi Marie, Life Insight Consultant, Ashland OR"
Aphrodite's Journey helped me uncover and heal deep seated issues with both my sexuality and sensuality. It opened me to a new expanded sense of my Goddess/Feminine self that I am ever most grateful for. It was both an exciting and wonderfully surprising experience." "Aphrodite's Journey was a liberating experience for me which helped me to re-awaken my power. This work has carried on into my life and supports my on-going transformation." I was astounded and delighted and completely THANKFUL at the way the weekend unfolded, due to your insight and creativity and intuition and true embodiment of Aphrodite. I see that you are channeling something so profound and so healing and so full of love. And that you do it all so lightly and with such joy and humility. I've done so many transformation type workshops and events in my life and I don't think I've ever been so SATISFIED at the outcome as I feel right now. I truly made a leap in consciousness and a solemn vow to never to betray myself again, which feels rooted and grounded in my body thanks to the events of the weekend. And my heart opened so.